This delivery pouch from the Post Office of Ordnance Road in Coventry carries the post stamps of the area and is dated 1956. This piece of Telegraph memorabilia was a must buy for me as Coventry is where I was born and bred. A great bit of history. 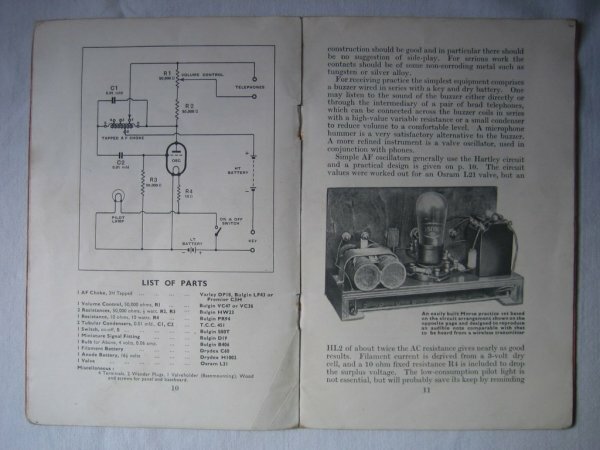 This catalogue from 1940 contains the full range of products supplied by Premier Radio in 1940. It describes and illustrates everything from valve receivers, amplifiers, speakers, Morse keys, amateur transmitting stations and associated equipment. It is in great condition and gives a wonderful insight into the equipment available in the day including prices. Premier Radio. Morris & Co (Radio) Ltd were based at Jubilee Works, 167 Lower Clapton Road E5 London. 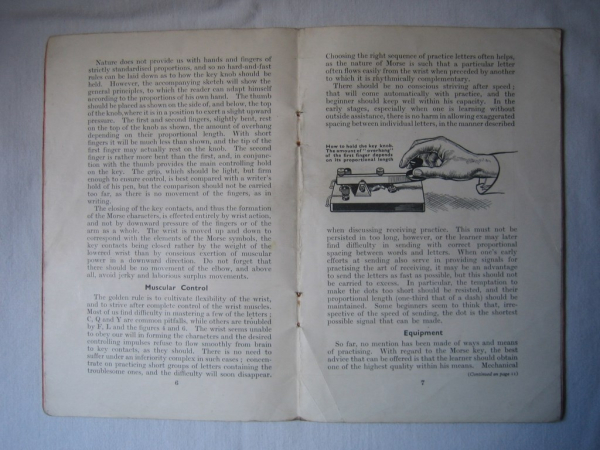 This manual from 1941 titled “How to Learn the Morse Code in Thirty Minutes and Remember it” was published by Gale & Polden Ltd. It was priced at Sixpence and contains techniques by the author Ernest Nicholson on how to teach Morse code in half an hour. Gale and Polden Ltd. was founded in Brompton, nr Chatham, Kent in 1868 but subsequently moved to Aldershot where they had their Wellington Works, they also had outlets at London and Portsmouth and produced a number of different publications in this series including, Orders, Military Map Reading, Compass reading and Notes for Section Commanders. This rare pad of radio message received sheets came from the radio room at Leith Harbour, South Georgia in the South Atlantic. I came across both this and an old set of headphones when on deployment there just after the Falklands War in 1982. This item had been there since the whaling station was operational in the 1920's but by 1982 had been long since abandoned. Abridged Catalogue and Manual of Telegraphy by J.H. Bunnell circ 1892. 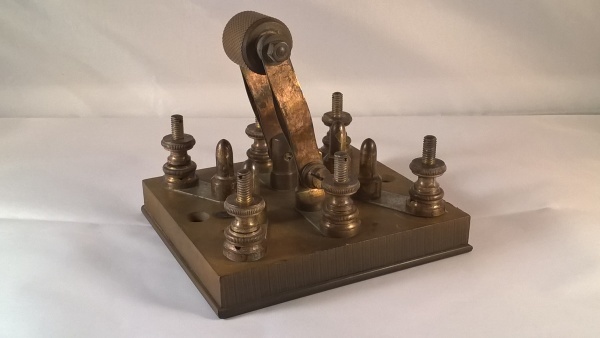 This is an Abridged Catalogue and Manual of Telegraphy and description of instruments adapted for use on private telegraph lines by J. H. Bunnell dated 1892. At that time Bunnell were based at the address of 76 Cortlandt Street, New York. On the front cover it also describes the content as a Students Manual for the practical instruction of Learners of Telegraphy and gives practical instruction of learning the art with the view of continuing in employment in this field. It is in great condition for its age and is full of wonderful illustrations of current instruments manufactured and supplied by Jessie H Bunnell in 1892. Wireless Operating Simply Explained by W.E. Crook circ 1940. This booklet explains in good detail the principals of the job of a wireless operator at the start of WW2. It is a fascinating read full of illustrations and explanations about the equipment and procedures of the day. It is one of a series of books published by Sir Isaac Pitman and Sons Ltd. around this time. W.E. Crook was also the author of other booklets of similar interest including Elementary Mathematics for Wireless Operators and Wireless Telegraphy – Notes for Students. 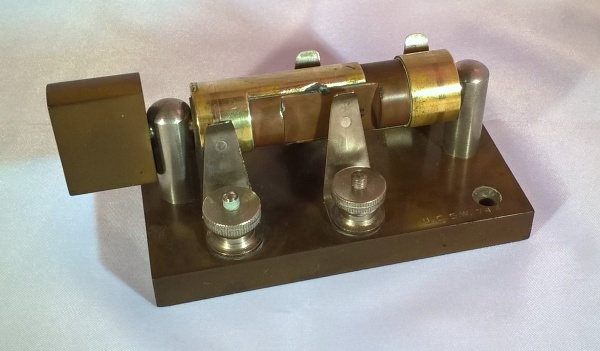 Switch Pattern 1549 (Part of Royal Navy Receiver Outfit C) circ 1912. Receiver outfit C is a tuner outfit consisting of separate inductance and condensers and therefore cannot be used alone but must be used in conjunction with a detector (e.g., Board E) or an amplifier. 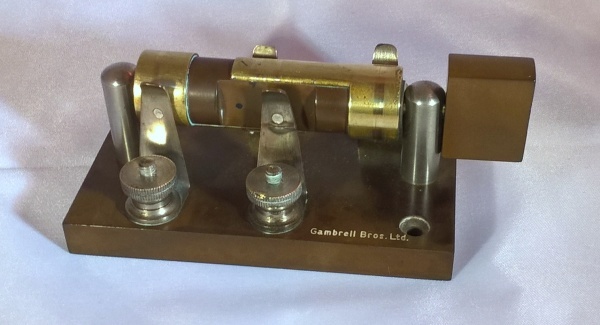 Rotary Barrel Switch – Gambrell Bros Ltd circ 1920. 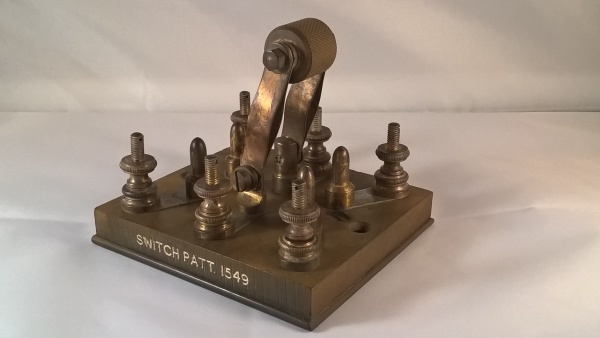 This is a nice example of a rotary barrel switch manufactured by Gambrell Bros Ltd around 1920. It is marked on the top surface of the Vulcanite base, on one side, Gambrell Bros Ltd and on the other U.C.5.W. 744., possibly indicating a rating of 5W. It has four terminals, two on each side which, when the barrel is rotated, connects both sides of the switch on two different circuits. The Vulcanite barrel has central relief cut outs which give the switch its open position and brass overlay being the switch lines.